The ReSeeVit Retinal Imaging System uses a Canon CR-2 Digital Retinal Camera, the epitome of state-of-the-art, non-mydriatic imaging technology offering dramatically reduced brightness, improved overall comfort, and significantly shorter exam time. For patients undergoing non-mydriatic retinal exams, the bright flash can be unpleasant. The CR-2 reduces patient stress by significantly reducing the flash intensity, providing more comfortable retinal exams. Retinal exams play an important role in screening for major illnesses. The CR-2 camera accommodates easier examination procedures, supporting better overall healthcare for your patients. ReSeeVit's powerful panoramic feature allows for simultaneous comparison of multiple images of the same eye taken over time. By stitching together the images, you can create a large panoramic view. 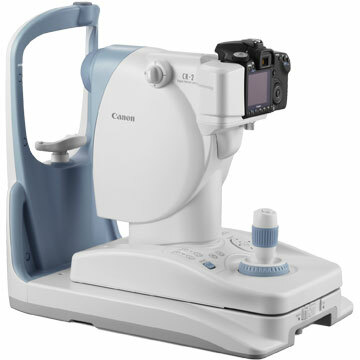 Canon CR-2 Digital Non-Mydriatic Retinal Camera - Incorporates the latest in Canon non-mydriatic imaging technology and enhancements in a compact, light design. It can easily be installed and takes up minimal office space. For added convenience, the camera is mobile for easy transportation. The illuminated control panel on the CR-2 allows medical staff to easily navigate operations in dark rooms. Lower Cost of Ownership - Contributing to a lower total cost of ownership, the CR-2 can help reduce energy costs in medical facilities with its energy-efficient design. Compact and Lightweight - The small design of the CR-2 provides the smallest footprint of any Canon retinal camera to date. Low Flash Photography - The low flash intensity of the CR-2 minimizes miosis, shortening the time required for taking multiple exams. The reduced brightness helps improve patient comfort and reduces the "ghost" image that comes with after-exposure. Ergonomic Control Panel - The simplified design of the control panel ensures easy operation by a trained examiner. A single joystick positions the camera for the desired point of view. In dark rooms, the operation panel illuminates for easy navigation, and the 35 mm working distance between the patient and the operator allows easy access to the patient's eyes should they need assistance with opening their eyes. Take a look through our products and digital imaging packages. Sign up for a 15-minute efficiency evaluation to see other areas wherein your practice could improve. If you have any questions about our retinal imaging solutions, please feel free to contact us.